Tiny Stoves by Alaska Masonry Heat – The finest quality small cast iron stove. We live in a time where many people know the price of everything, but the value of nothing! 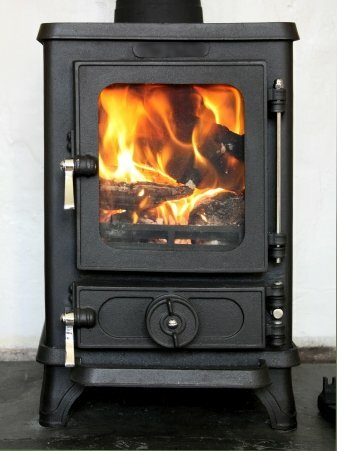 Welcome to TINY STOVES by ALASKA MASONRY HEAT, your purchase point for the Salamander cast iron wood stove, built by Salamanderstoves.com in Devon, England. We sell and deliver the Salamander to all 50 states in the U.S. and all the Provinces in Canada. We sell the Salamander (DEFRA approved) only because we believe in the cleaner burn and its low emissions that would allow this heater to be used in smoke control zones. The price for the Salamander SE is $1,039.00, which includes shipping within the Continental US. Call for quote for additional options. Also notice options available as you view the Salamander. Each Salamander comes complete with multi-function tool, mini dust pan and brush, a full set of installation instructions, and a 5 year warranty. Due to the overwhelming demand for this tiny wood stove, the Salamander is available in factory black only. No colors available at this time. You may, however, purchase a premium grade high heat stove paint like “Stove Bright” from your local hardware store or hearth shop and paint your Tiny Stove yourself. Before calling or emailing with questions, please read Installation and operating instructions for the Salamander tiny stove on our FAQ page. Alaska Masonry Heat specializes in the construction and distribution of Tulikivi wood-burning masonry heater.